Content marketing is a beautiful thing, a great way to build an audience and grow your business. That’s if your content is actually getting found by the folks who might buy your product or service. Most of us would love to have more people reading, listening to, and watching our content. We buy traffic or try the latest “Get people to actually pay attention to you on Facebook” strategy. And those can be helpful. But one of the smartest things you can do for your content is to make it easier and more fun to share. Even better, as long as you’re starting with high-quality work, you can do it without spending a lot of time or money. By the way, I’m including links from other websites as “shares,” as well as the usual assortment of retweets, likes, and plus-ones. If your audience is helping you get the word out about your content, we’re counting that as a share. Here’s a straightforward plan to format and present your content so that lots more people want to share it. 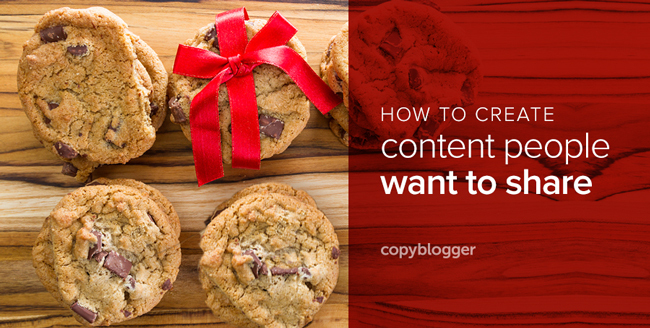 If you’re a regular Copyblogger reader, you knew this one was coming. More people (especially those movers and shakers with large audiences) will share your content if your content makes them look smart for sharing it. That means it needs the magic combination of usefulness and fascination. In other words, it needs to speak to something the audience cares about, and it needs to do that in an interesting way. There are some “content” sites out there that rely on enticing headlines and strong images to send us to weak, pitiful content — I call it CRaP. Don’t do that. Use your skills to get a larger audience for content that’s worth consuming. Anything less is a waste of everyone’s time. Here’s something weird about social sharing: Lots of people share content without reading it. They do that mainly based on the headline and the image. Why does that help you? Because it lets your content surf around on the web, from social user to user, until it finds the perfect person for your project or business. If your headline is both accurate and enticing, it can steer your content around the web until it finds that perfect person for you. And if your headlines aren’t accurate or enticing, you can go grab a free ebook to help you with that — it’s in our content marketing library (registration required). Along with headlines, strong images work hard to find more readers for your content. They can instantly grab attention and invite a second look at that high-quality content you worked so hard to create. All of the social media sites are becoming very image heavy — it’s your job to know what types of images do well on the platform you’re targeting. Keep your eye on what’s doing well (for you and for other sites in your topic), and don’t be afraid to try new ideas. Make sure your images are sized properly for the platform, and experiment with things like text overlays (as we’re doing these days with the Copyblogger post images). First impressions matter — and when folks click through to your article (or are deciding whether or not they want to share it), the website experience is important. So make sure your site is readable and good-looking, and format your content to make it easy to scan and skim. If you haven’t implemented social sharing buttons on your site yet, that’s a quick and simple way to make your content easier to share. Sure, users can always cut and paste your URL into their social platform of choice — but most won’t. Make it easy. Want more shares? Ask for them! Want links or comments or reviews or content ideas? Ask for them! If you want your audience to do things for you, it’s a great idea to communicate your desires clearly. Of course, the audience still has to like your content and find it valuable — which is why we work on points #1-5 first. But once you know you’ve got something worth sharing, don’t be shy about a clear call to action — let your audience know how they can help get the word out. This one (like #1) takes more time, but it will repay you many, many times over. If you don’t currently have a great network of people who like your work and want to share it with their own audiences, it’s time to begin building one. In today’s world, we don’t create success all by ourselves. Success is a team activity — and it’s up to you to build a strong, healthy team. There are a lot of ways to do that — I spelled out some of my favorites in the ebook I wrote on Effective Content Promotion. That one, again, is free when you register for our members-only content marketing library — along with 15 other titles on just about any aspect of content marketing you can think of. From SEO to landing pages to content strategy, we have you covered. The complete collection is free with your registration, along with a 20-part course on marketing basics, delivered by email and written by me. Click here to get access. Share this post if you enjoyed it? If you found this post interesting and valuable, I hope you’ll share it on Facebook, Twitter, LinkedIn, or your platform of choice. 🙂 Just use those handy social sharing buttons at the top of the post!